Economically – In many communities, unemployment or under-employment are key factors in the hopelessness families are facing. Re-Vision will will partner with individuals in these communities to start small businesses to provided income for their families, and often, much-needed resources for the community. Re-Vision may offer small loans with financial management training, construction assistance, or vocational training to help insure the long-term viability of these businesses. There may also be instances that Re-Vision assists a community by establishing larger enterprises operated by Re-Vision or by a community foundation, if one exists, to provide jobs and meet key community needs (e.g. water purification, block fabrication, or schools). Educationally – The quality and length of education for many is a great limiter to vocational success. Re-Vision will work to build, staff, and furnish schools that will enable the educational preparation that will equip young people for careers that will not only bring them success, but also provide needed services to their communities. Re-Vision will also help in developing adult vocational training to teach the practical skills needed for work within the community. Re-Vision may regularly partner with other organizations in this arena for child sponsorship and/or school administration. Medically – Re-Vision will work with communities to address illness and promote wellness. Partnering missional medical professionals with local providers, Re-Vision will attempt to address common healthcare issues as well as those requiring more specialized care. Re-Vision will also bring nutritional training and clean-drinking water initiatives to those communities in need. Medical care initiatives will include, but not be limited to: diagnosis and treatment of physical ailments, wellness, dental care, optometry care, audiology care, etc. Spiritually – Re-Vision believes that a person is body, mind, and spirit. A holistic view of impacting a community then, by definition, must include a spiritual emphasis. Re-Vision is a non-denominational Christian service organization with a ministry modeled after the call of Matthew 25 to serve “the least of these” in ways that will bring God glory and make Him known. We believe in, because we’ve seen it first-hand, the hope and stability a vibrant spiritual presence brings to a community; so we work with local pastors and churches, where like-minded ones exist, and help plant new ones where they don’t. Work here may include church construction, leadership training, children’s ministry work, evangelistic efforts, etc. Concord Baptist Association Director of Missions Dr. Kevin Minchey preaches at Juan 3:16 in Los Asises. Los Asises de Sainagua is a "suburbanish" community in the San Cristobal province. There we work with pastor Ulises Casanova and his church Juan 3:16. We partner there with Compassion International to serve over 400 children and their families. Mission team activities can include: construction, sports, evangelism, discipleship, kids' clubs, men's ministry, wormen's ministry, leadership development, medical/dental ministry, home visits, and more. Sports ministry is a key component of work in the port city of Haina. This court is across the street from El Refugio, our partner church. Haina is a large port city in the San Cristobal province. With a population of over 160,000, Haina has a more urban flavor. There, we work with pastor Julio Cesar and his church El Refugio and with partner organization LoveServes. Pastor Cesar is a church planter, working now on establishing El Refugio #6 in Haina. He is also a master welder and is seeing his vision for a vocational school come to fruition. Teams have played, and continue to play, an integral role in building and resourcing the center. Feeding ministries are a key part of the work in the DR. 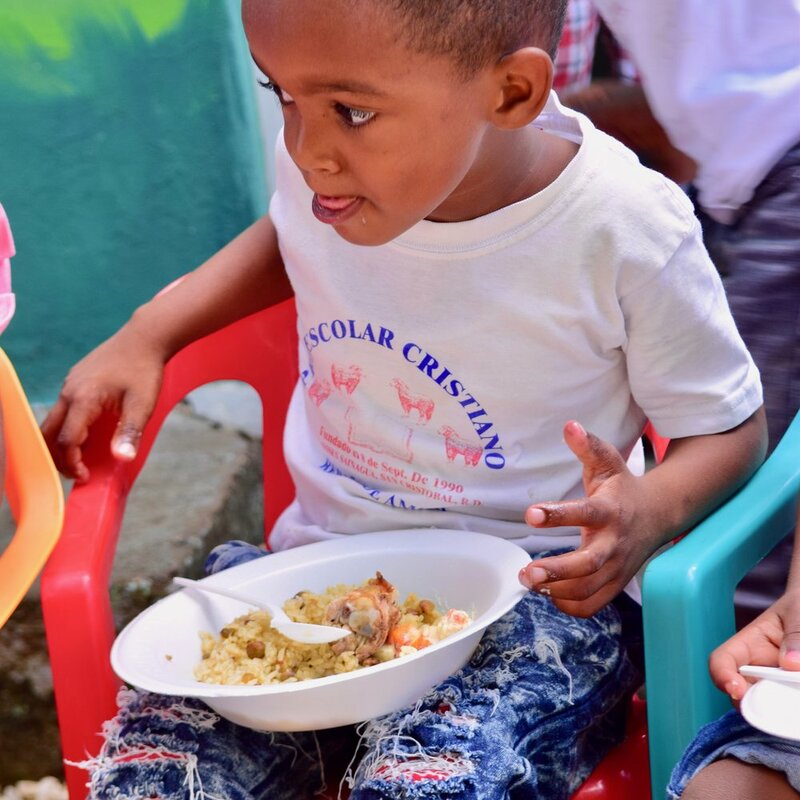 In many cases, the only meal eaten each day comes from our ministry partners. Palmar de Ocoa is a fishing community in the Azua province. This area represents the most rural area Re-Vision serves and is one of the poorest. Re-Vision serves with pastor Pedro Sanchez and his church Jesus, the Only Hope. We also partner there with LoveServes, Compassion International, and Willowcreek Church. A church, a child development center, and a vocational training center are just a few of the projects completed or planned there. But the needs are diverse and great - everyone can make a difference. Send me information about missions opportunities for all that are checked.